This letter was written by 18 year-old Corporal Leonard Doig (1843-1912) of Company F, 14th New York Infantry. 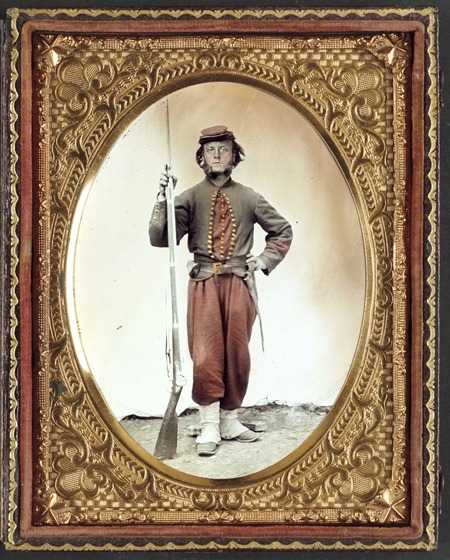 He was the son of railroad agent, James Doig (1808-1869), and Betsey Murray (1821-1888) of Oneida County, New York. In 1870 Leonard was an unmarried bookkeeper with his brother Edward and boarding with the Orrin A. North family and 3 others in New Britain, Hartford Co., Connecticut. In 1880 he was a bookkeeper living with his brother Augustes in New Britain, Hartford Co., Connecticut. Boston on the ship Columbus. FORMER OGDENSBURG MAN DIED IN EAST – LEONARD DOIG, VETERAN OF CIVIL WAR, DEAD IN MASSACHUSETTS – Boonville, October 30. – A telegram was received Tuesday morning by J. H. Doig announcing the death at 10 Monday night at Ashmont, Mass. of his oldest brother Leonard Doig. Leonard Doig was the eldest son of James and Betsey Murray Doig. He was born in Lowville, Sept. 19, 1843, and came to Boonville with the family when he was ten years old, where he resided until the breaking out of the Civil war, when he enlisted in Company F, under Capt. Charles Muller, 14th Regiment, N.Y.S.V., under Col., James McQuade of Utica. He served faithfully the two years that regiment was in active service, participating in every skirmish and battle during the bloody peninsula campaign, under Gen. George B. McClellan. After returning from the war he entered the banking house of Mr. Mirriam at Ogdensburg, where he remained for several years, and then removed to New Britain, Conn., where he was bookkeeper for the manufacturing firm of Russell & Erwin Manufacturing Co. Afterwards he was transferred to London, England where he officiated as manager of the firm’s London and continental business for many years. He returned to this country about 10 years ago, and has since resided in New Britain, Conn., and New York city. Mr. Doig was married three times and is survived by one son, Leonard Doig, and one daughter, Mrs. Florence D. Frost of Galveston, Tex. He is also survived by a sister Mrs. Angus C. Davies of Ashmont, Mass., and five brothers, James of New York, Edwin Murray of Denver, Colo., Augustus of New Britain, Conn., and Walter and John Howard of Boonville, N.Y. In the Civil War, the 14th New York was made up of a majority of abolitionists from the Brooklyn area. It was led first by Colonel Alfred M. Wood and later by Colonel Edward Brush Fowler. The 14th Brooklyn was involved in heavy fighting, including most major engagements of the Eastern Theater. Their engagements included the First and Second Battles of Bull Run, the Battle of Antietam, Fredericksburg, Chancellorsville, Gettysburg, The Wilderness, and Spotsylvania Court House. During the war, the men of the 14th Brooklyn were well known by both armies and throughout the country for their hard drill, hard fighting, and constant refusal to stand down from a fight. During their three years of service they never withdrew from battle in unorderly fashion. On 7 December 1861, the State of New York officially changed the regiment’s designation to the 84th New York Volunteer Infantry (and its unit histories are sometimes found under this designation). But at the unit’s request and because of the fame attained by the unit at First Bull Run, the United States Army continued to refer to it as the 14th. In the early part of the war, when the 14th Brooklyn was in General Walter Phelps’ brigade, the brigade was named “Iron Brigade.” It would later to become known as the “Eastern Iron Brigade” after John Gibbon’s Black Hat Brigade was given the name “Western Iron Brigade”. At the conclusion of the war, all members of the “Eastern” or “First” Iron Brigade were given medals for their service within the Iron Brigade. Yours of the 18th was fully received and I should have answered it before but I have not had much time to write lately. Besides that, there has nothing occurred that would be interesting to you. I suppose that you have heard of our great victory at Hatteras Inlet in which Gen’l Butler took so many prisoners and consequently I can write no news in regard to that. There is nothing going on her at present except now and then a skirmish with the rebel pickets in which there is no great loss on either side. I was out on picket the other day but did not see anything of any consequence. The health of the regiment is very good, some few of them having the fever and ague. As this regiment is a favorite one, we do not have any of the more laborious kind of work to do such as chopping and digging. So if you would like to enlist in a good regiment where no doubt you will have plenty of fighting, I would be very happy to have you in Company A.
I hope you will excuse this short and interesting letter and write again as soon as convenient. This entry was posted on Tuesday, October 28th, 2014 at 7:34 pm	and posted in Uncategorized. You can follow any responses to this entry through the RSS 2.0 feed.